Often referred to as a near-perfect food; Chlorella (Chlorella Vulgaris) is a microscopic freshwater algae containing a broad spectrum of nutrients including folic acid, vitamin C, B12, and over 60% protein. 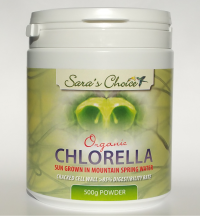 Sara’s Choice Chlorella contains up to 26mg chlorophyll per gram, which is known to promote elimination of toxins. It also contains Chlorella Growth Factor (CGF) which appears to enhance RNA / DNA functions responsible for energy production at the cellular level. We searched far and wide to bring you the finest organic Chlorella available today. HOW SAFE IS YOUR CHLORELLA BRAND? Each Sara’s Choice chlorella batch holds an independent traceable certificate for heavy metal and radiation safety. Click here for certificate page.. The most digestible on earth due to a patented cracked cell wall process making it more than 85% digestible. Cultivated in natural sunlight using a pristine water source from environmentally protected mountain spring water. Organically certified at source by Naturland Germany – awarding it one of the world’s highest organic standards. Independently tested and certified heavy metal and radiation safe by SGS Food testing labs – Hers are the only algae in the British Isles to carry this level of Safety certification. It is a complete food – containing fibre, essential fatty acids and a full spectrum of vitamins, minerals, all essential & non essential amino acids, enzymes, antioxidants, mucopolysaccharides, and phytonutrients. Among these nutrients are significant amounts of Vitamins A, D, E, K1, all the major B vitamins B1,B2, B5, B6 and B12, iron, calcium, omega 3, potassium, phosphorus, biotin, magnesium, folic acid, and zinc; an abundance of naturally occurring beta-carotene and lutein.